The Economics Anti-Textbook: Why should students put up with textbook nonsense about labour unions? 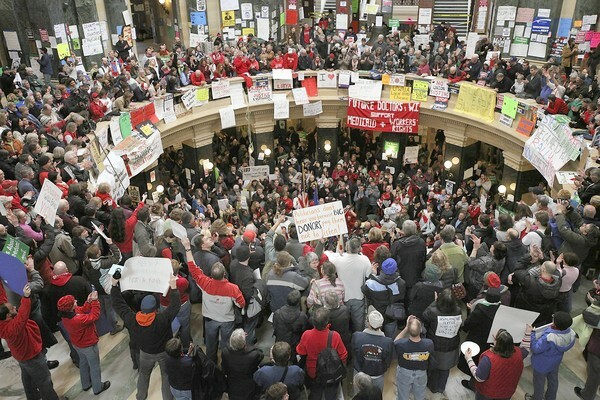 Why should students put up with textbook nonsense about labour unions? The heating up of the class war in Wisconsin (nicely described by Paul Krugman in his recent NY Times commentaries and that generated this great spoof phone call from the Buffalo Beast that outed "Koch whore" Gov. 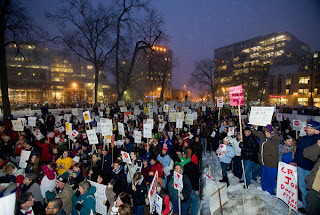 Scott Walker) prompts a brief comment about the textbooks' treatment of labour unions. As we wrote in The Economics Anti-Textbook, "unions get a 'bad press' in mainstream economics textbooks" (p.173). This is partly because the default model of the labour market is the usual one of perfect competition, so employers have absolutely no market power over the wage. When a labour union is introduced into such a setting, it appears as a source of unopposed monopoly power and students have been already been persuaded of the evils of monopoly in their study of product markets. Unlike some texts, Parkin and Bade do discuss a monopsony model, in which the employer has market power, although (as with almost all texts that mention this model), they marginalize it by defining it in a very narrow way: "a market in which there is a single buyer", a market type that "is unusual, but it does exist" (p.416). They go on to present a brief discussion of monopsony and unions. They write: "If the union (monopoly seller) faces a monopsony buyer, the situation is called bilateral monopoly. In bilateral monopoly, the wage rate is determined by bargaining." (p.417). But wait! Students who are alert and thinking for themselves could realize that wage determination by collective bargaining is not "unusual" at all. So employers' market power over the wage must not be unusual either. 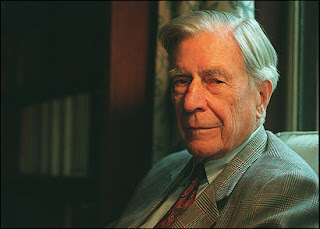 Perhaps, such students might conclude, unions are just exerting 'countervailing power' -- to use the term coined by the most famous Canadian-born economist, John Kenneth Galbraith, whose name does not appear in Parkin and Bade's book. Parkin and Bade's treatment of labour unions looks good in comparison to Mankiw, Kneebone, McKenzie and Rowe's Principles of Microeconomics (3rd Canadian edition, 2006) where labour unions get mentioned in only a single paragraph in a 500 page book. That explains only that unions can achieve "above-equilibrium" wages through the threat of a strike. Monopsony and employer power over the wage are concepts omitted from the book. I suspect that it will be the rare student who escapes the subtle (or not so subtle) indoctrination here that labour unions are not socially desirable. Not all books, however, are this bad. For example: Frank, Bernanke, Osberg, Cross and MacLean's Principles of Microeconomics (3rd Canadian Edition, 2009) has a detailed yet concise description of the actual effects of labour unions, concluding that "studies suggest that union productivity may be sufficiently high to compensate for the premium in union wages. So even though wages are higher in unionized firms, these firms may not have significantly higher labour costs per unit of output than their non-unionized counterparts." (p.373). In their Microeconomics in Context (First US Edition, 2005), Goodwin, Nelson, Ackerman and Weisskopf not only discuss monopsony and bilateral monopoly, but they write: "More common are cases of oligopoly and/or oligopsony (few buyers) in labor markets. In many labor markets the employers, employees, or both have some amount of market power, and their relative power is important in predicting outcomes." (p.314). These few examples suggest that there are significant differences in the textbooks' treatment of the nature of labour unions and their economic effects. Now how can the situation for students be improved? The simplistic story of consumer sovereignty -- where producers just produce what the consumer wants -- does not work here. The consumers are the students, not the professors who (believing themselves benevolent dictators) choose their texts. But the dictatorship of the professoriate is not necessarily a benevolent one. Dissenting students really have two choices: exit or voice. With exit, they give up on economics courses and study other subjects. With voice, they complain and try to make things better. Up until now, I suspect that 'exit' has been the option of choice. It's easier and requires no organization, but it does little to improve the situation and those students who exit miss out on the real benefits of studying economics. One of the reasons we wrote The Economics Anti-Textbook was to help students to see the kind of subtle indoctrination they were being subjected to by the typical mainstream introductory text and to protect themselves against it. But they can also use it for 'voice', to challenge their professors' choice of text.